Most of the time I try not to think about the details of this day six years ago when my long-awaited baby was eventually delivered alive and seemingly well... and then a few hours later turned blue and was taken to SCBU (NICU) for a week. I try not to dwell on those long tear-filled days and how I yearned to hold my baby without wires, tubes and bossy nurses in the way. How each attempt at feeding him, and the hungry screams that followed, broke my heart just a little bit more. How he didn't feel like 'my' baby until I "stole" him one day during a fire at the hospital and snuck him back to my room for a few hours. I have never felt so completely exhausted and emotional (hormones!) and alone as I did during those days. I'll admit that even after all this time, I get upset when people reminisce about that day. Of course, for the other 364 days a year I completely forget about all that and just see the amazing person that came into my life on 19th July 2006. You should be proud, he is one of the nicest polite little boys I know (and I can totally see him saving all that niceness for outside the house ;))! Must have been very scary for you but I do like a story with a happy ending! :) Happy birthday. 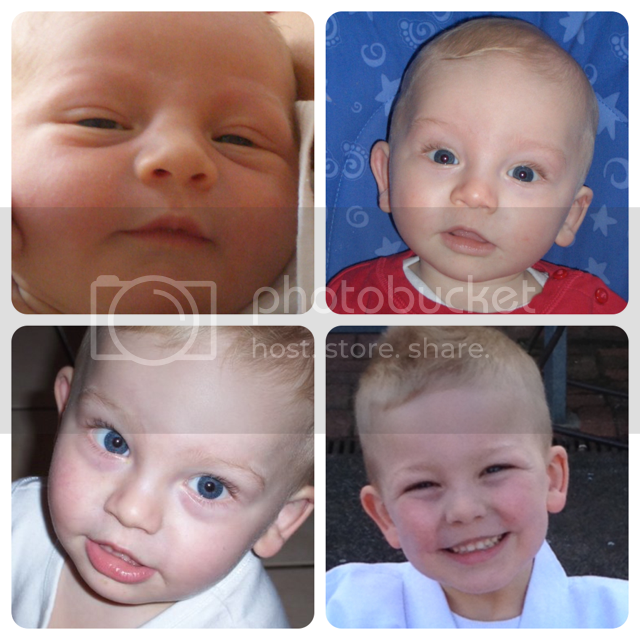 Ohhhh happy birthday beautiful boy... he is so gorgeous! What a handsome boy :O). Hau oli 'la hanau to him. We, mothers, will never forget times like those. Even tho we are past the emotional turmoil it is still there when triggered somehow.